before restoration. Photos courtesy Beatrix Farrand Society. 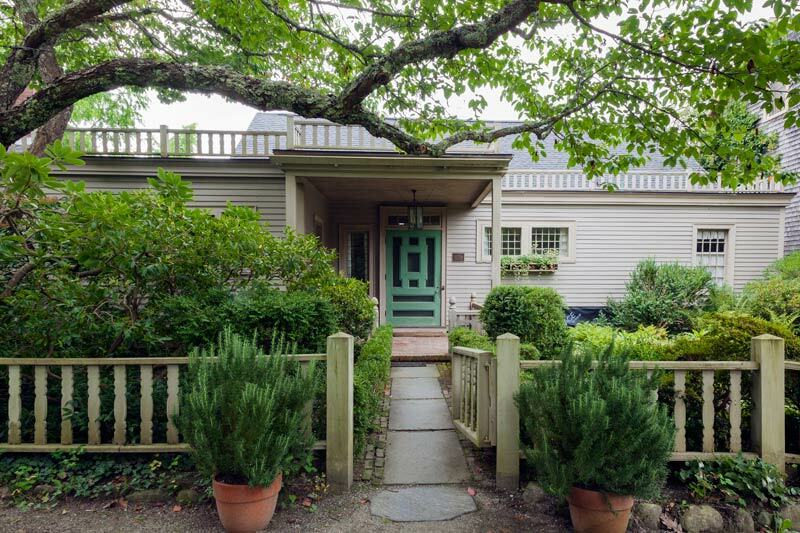 Garland Farm was the last home and garden of the pre-eminent landscape architect Beatrix Farrand, who lived there from 1955 until her death in 1959. Farrand was one of America’s most significant practitioners from the 1890s through the early 1940s. She studied horticulture with Charles Sprague Sargent, founder of the Arnold Arboretum, and learned about landscape design from extensive travels in America and Europe. Her mentors included Gertrude Jekyll and William Robinson as well as her aunt, Edith Wharton. Farrand was renowned for designing private estate gardens, a number of which were located in Maine, as well as consulting on projects for some of the country’s most prestigious universities and colleges. Over the course of her long career, she received more than 200 commissions, including: Dumbarton Oaks, Washington, DC; the Abby Aldrich Rockefeller Garden, Seal Harbor, Maine; Eolia, Waterford, Connecticut, and the old campus of Princeton University in New Jersey. She was a founding member of the American Society of Landscape Architects in 1899 and received numerous awards during her lifetime. The gardens at Garland Farm are Farrand’s last design and a significant example of her work. They are a rare instance of a garden designed for all seasons. The formal plant palate reflects her admiration for the planting style of the influential English garden designer Gertrude Jekyll as well as her own expert knowledge of horticulture and interest in native plants. 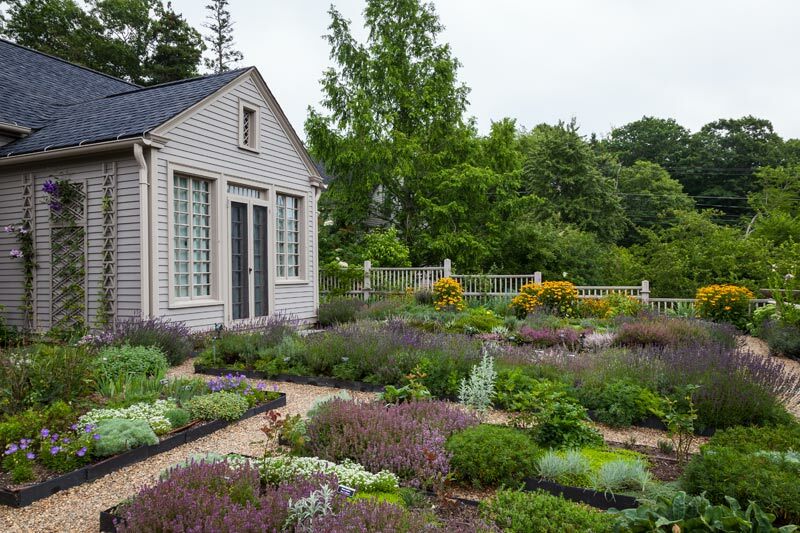 The cottage-style gardens bring together many of the design elements Farrand treasured: intimacy, sophisticated plantings, and appropriateness for the house. The centerpiece is a small square Terrace Garden. Farrand designed this garden to take advantage of views out from the interior of the house. She planted perennials in the soft cool pastel colors that she loved on the side overlooked by her suite, and warmer tones of yellows and oranges on the opposite side where her caretaker lived. 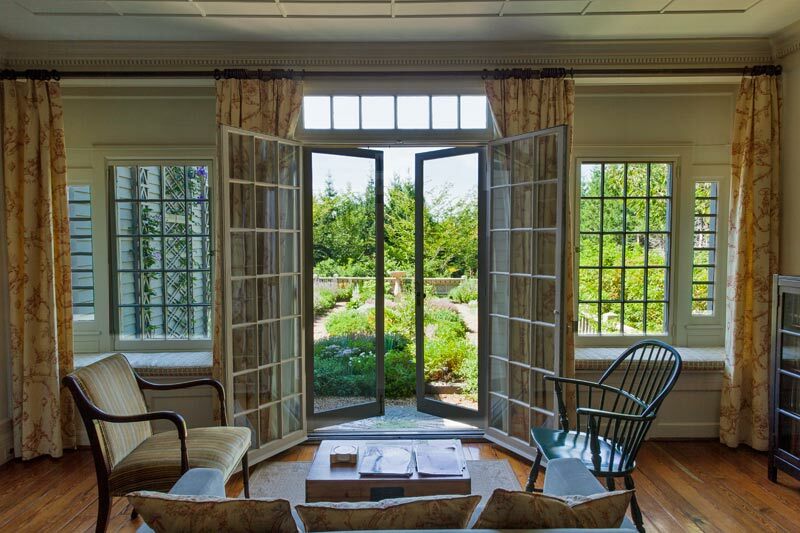 The central panel of the garden viewed from the study is filled with heathers and lavender. 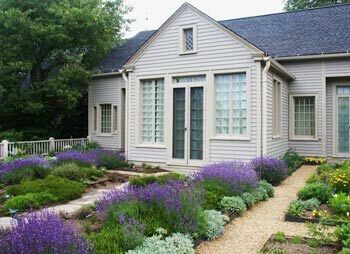 For the small Entrance Garden, she selected Asian shrubs and groundcovers. 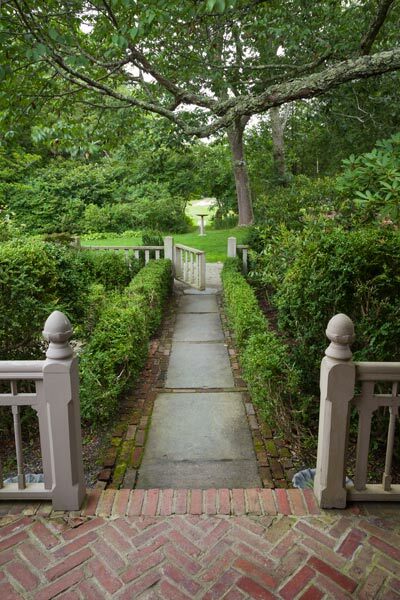 The gardens at Garland Farm contain significant garden ornaments, including an antique Asian Bodhisattva statue and a carved fence from Chiltern, a former estate in Bar Harbor. Prior to moving to Garland Farm, Farrand lived at Reef Point in Bar Harbor, Maine, which was renowned for its extensive horticultural collections. 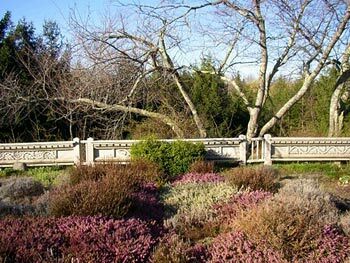 She transplanted a number of Reef Point specimens to Garland Farm, including a magnificent Sargent cherry tree, ornamental shrubs, an extensive collection of heaths and heathers, and numerous rare perennials, many of which still survive on the grounds today. Terrace Garden at Garland Farm in 2011 after restoration. Photo courtesy Beatrix Farrand Society. In Farrand’s lifetime, Reef Point Gardens was open to the public, “to all real plant lovers.” Visitors came from all over to view her extraordinary plant collections and study in her library. In 1955, when she was in her eighties, she made the difficult decision to close down Reef Point. While Garland Farm was not open to the public due to her failing health, friends were welcome. 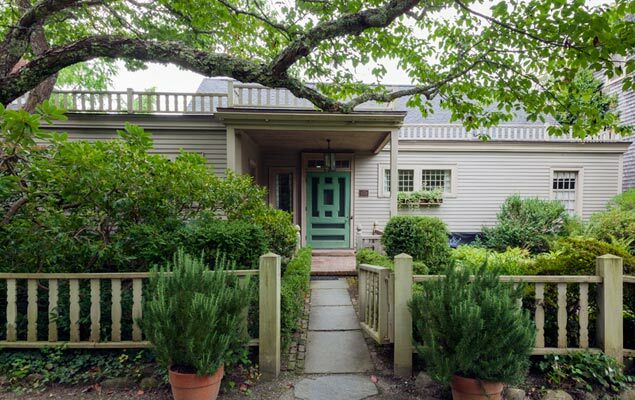 In addition to bringing some of her favorite plants to Garland Farm, the bulk of Farrand’s collections were sold to Charles K. Savage who used some of them to embellish the grounds at Thuya Lodge, the former home of Joseph Curtis, in Northeast Harbor. Most of the plants, including Farrand’s notable collection of azaleas, were used to create a new garden across the road from the Asticou Inn in Northeast Harbor. Today both Thuya Garden and Asticou Azalea Garden are managed by the Mount Desert Land and Garden Preserve. 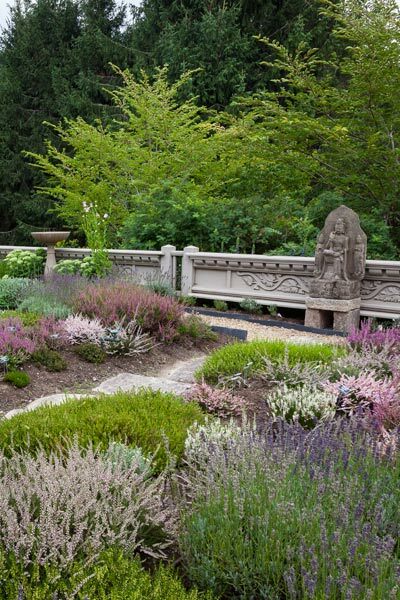 The Beatrix Farrand Society’s mission is to restore Garland Farm’s gardens, offer educational programs, and build a landscape library similar to the one at Farrand’s former estate, Reef Point. 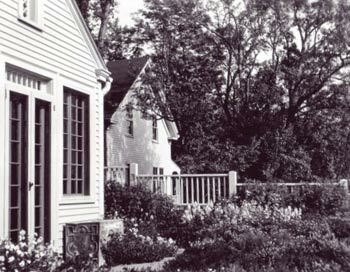 After Farrand’s death in 1959, Amy and Lewis Garland continued to live at Garland Farm, where they managed the grounds and gardens. After the death of Lewis Garland in 1964, the property was sold. Each of the subsequent owners served as thoughtful stewards for the property, although the gardens began to lose some of their character. In 2003, when Garland Farm came on the market again, a Save Garland Farm initiative was formed through the Garden Conservancy. Private donors enabled the group to purchase the property and form the Beatrix Farrand Society so that they could continue the educational goals of Beatrix Farrand. When the Beatrix Farrand Society acquired Garland Farm from its last private owner in 2003, the overall character of the garden had begun to deteriorate. One of the Society’s primary goals was to restore the gardens as an example of one of Farrand’s most intimate designs. The Society commissioned a Cultural Landscape Report that provided a detailed site history, assessment of significance, plant inventory, and treatment recommendations for rehabilitation. Phase I, which was underwritten by a grant, consisted of the rehabilitation of the Terrace Garden. This work, which began in 2007 and was carried out by the Maine Master Gardener Volunteers, was completed in 2011. At the same time the original dairy barn on the property was converted into an educational facility. In order to proceed with Phase 2, the rehabilitation of the Entrance Garden, additional funding is needed. In order to carry out the mission of the Beatrix Farrand Society, more public awareness needs to be developed about the significance of this important historic designed landscape. Interested parties can help fund educational initiatives and restoration efforts by making a donation. To make a donation or find out more about the Society’s goals, resources, and accomplishments visit www.beatrixfarrandsociety.org. Sue Anne Hodges has been inspired by Mount Desert Island since she was a student in photography school. Photographing the island, which started as a personal project, has grown over the years to become an important part of her professional work. Her images have been featured in Down East Magazine, DeLorme publications, The Bar Harbor Chamber of Commerce Guide Books, and more. Sue Anne has been a professional photographer for over 25 years. For 15 years, she shot and supervised photography for a major retail advertising studio. In 1995, she opened her own studio where she continued to shoot for retail clients, while expanding her business to include other creative and fine art projects for which she has earned many awards. Today, Sue Anne splits her time between Maine and Massachusetts where she shares her passion for photography with her students at New England School of Photography. Sue Anne is a resident of Seal Harbor Maine and West Newbury Massachusetts. She is represented by Redfield Artisans’ Gallery in Northeast Harbor, Maine.